Khaleesi is a large dog (80+ lbs) and I'd started noticing her groan every time she got off her previous dog bed. On top of that, her breed (German Shepherd) is prone to hip-related issues as they age, and I'd become concerned about how stiff she seemed to be after laying on her bed. We'd always used the typical dog bed you find at TJ Maxx or Petsmart, which can be cute, but are admittedly not that supportive for a large dog. Wanting to test out how her bed felt, I sat on it and sunk to the floor. Obviously I weigh considerably more than my dog, so I tried just placing a hand on her old dog bed and was shocked I could feel the hard wood floors underneath us. In that moment it became obvious that despite having what seemed to be an okay dog bed, my little pup was basically laying directly on the hard floor... thus, it wasn't a surprise that I was noticing her groan and become more stiff. 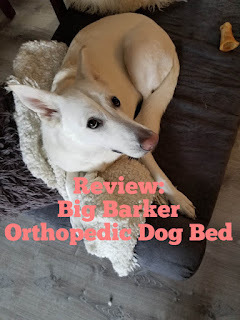 I started doing some research on orthopedic dog beds for larger breeds I could invest in and kept seeing reviews for Big Barker. The price was expensive compared to what we'd paid for a bed in the past, but I couldn't deny the fact she needed something better and this would be a solid investment. After reading countless reviews, we decided to purchase the Big Barker 7" Pillow Top Orthopedic Dog Bed (Headrest Edition) for Large and Extra Large Breed Dogs in the size Extra Large (XL). The bed was definitely a splurge costing $279.95 on Amazon, but 6 months later is still holding up and one of the best investments I've made for Khaleesi's well-being. The below video is a look at unboxing plus first impressions of the bed. Something particularly impressive is that the XL bed held the weight of Khaleesi, Mike and myself without sinking in! That's a whole lot of lbs on there. If you have a large or extra large breed dog, this is the perfect dog bed for your fur baby and the only one you'll ever need!